Apple just announced that its iMac lineup will get a meaningful update thanks to 9th-generation Intel Core i9 processors and a Vega graphics option. This is a big deal for iMac power users, but for me, an almost iMac power user, I’m feeling sheepish. Is Apple just going to keep stuffing new chips into its flagship desktop, ignoring innovative design, until I die? I don’t know. This new MacBook update is cool, though, since Intel’s i9 processors are solid pieces of hardware. You can now buy a 27-inch iMac with a 5K Retina display, a 3.6GHz 9th-gen i9 processor, and a Radeon Pro Vega 48 GPU for $3,150. 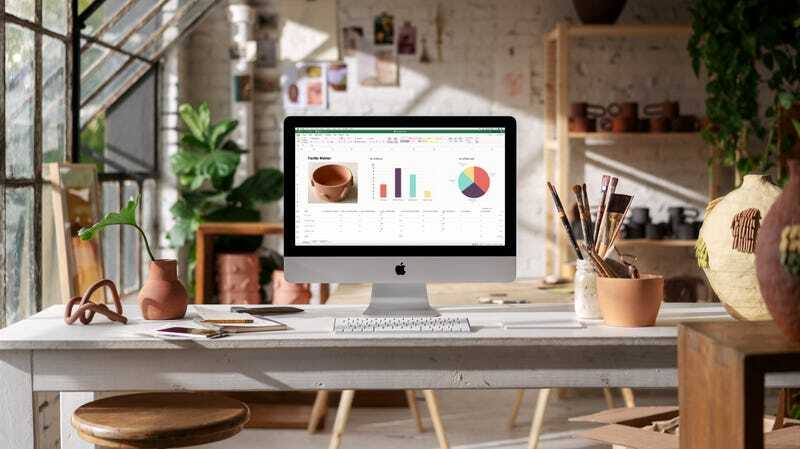 If you max out the specs with 64GB of RAM and a 2TB SSD drive, that iMac will cost you $5,250. At the same time, I’m not trying to throw my iMac out the window. It’s a fine computer in the same way that an iPhone 5 is a fine phone that can probably still make phone calls. Only probably. Folks who are fans of Apple innovation might feel duly disappointed that the company continues to recycle old designs while adding new components—many of which are far from the best—and calling the final product state of the art. That’s what the new iMac lineup feels like. Sure, you can get a great desktop computer for at least $3,000. If you’re hungry for the very best hardware, you can buy an iMac Pro with 256GB of memory for up to $16,000. It still looks more or less like the 2012 iMac on my desk, though.